Let defense stocks be your shield. The Aerospace and Defense industry led markets yesterday on a day led by the Industrials in general. Do today's headlines bring uncertainty to the group? Of course. If you follow me often, then you know that I follow this group closely and I trade it often. Last week, Action Alerts PLUS holding Raytheon (RTN - Get Report) , one of my long time favorites within this group reported top and bottom line beats for the second quarter. The firm guided both earnings per share and revenue higher for the full year. The stock sold off in a panic, along with another Sarge fave, Northrop Grumman (NOC - Get Report) . The problem? For Raytheon, it boiled down to significantly reduced guidance for operating cash flow. The cause here was the need to reduce pension obligations that was accomplished through the purchase of a group annuity contract to the tune of $923 million. Though costly, there is no operational impact, and obviously nothing there that impacts future demand. In fact, the firm ended the second quarter with an order backlog of $39.8 billion, which was more than 10% higher than it was at the end of the first quarter. Forget Apple Earnings Blowout, Is the Economy Poised to Collapse in 2019? For me as a trader, I had to buy more Raytheon and more Northrup as those shares probed bottoms last week. So far, so good. I cashed out my least-favorite name in the space, which is General Dynamics (GD - Get Report) to help pay for it. Fortunately, for this guy, General Dynamics spiked on the same day that these two bottomed. That was just luck. I would have dumped General Dynamics regardless. One thing that I think I do know is that the entire planet will for now continue to spend more on missiles, missile intercept, and on airborne, seaborne, and land-based drone capability. I do not expect to be wrong about this. Here is a chart of Raytheon. 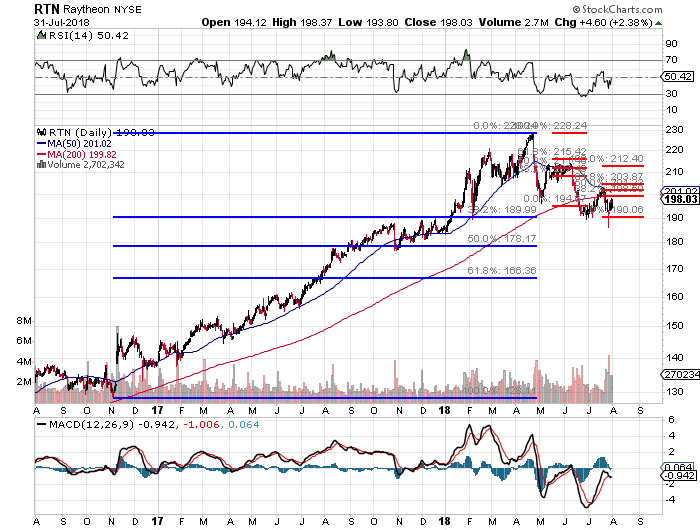 What I see here is that support has kicked in for Raytheon on multiple occasions since June at a 38.2% retracement of the move that began with election night 2016. As you can see, this year, since peaking in April, the name has also hit resistance at Fibonacci levels whenever attempts to rally have been made. This tells me as the investor that I have to use, at least for now, established levels as a guide. At the time of publication, Guilfoyle was long RTN, NOC, BA, LMT, KTOS equity.